When we bought our 1950s ranch, we thought it had hardwood floors everywhere except for the addition, and that we’d be able to refinish the floors and just add hardwood to match in the addition. Easy. Relatively inexpensive. Turns out there was only hardwood in the two small bedrooms, and the rest of the house had either subfloor or asbestos tile under the carpet. This meant we’d have to spend a lot more of the green stuff to update the flooring. Since installing hardwood was no longer in the budget, we had to come up with a plan B. Carpet was out of the question. (Have you ever seen the dirt that collects under carpet? YUCK!) So we decided to go with laminate. 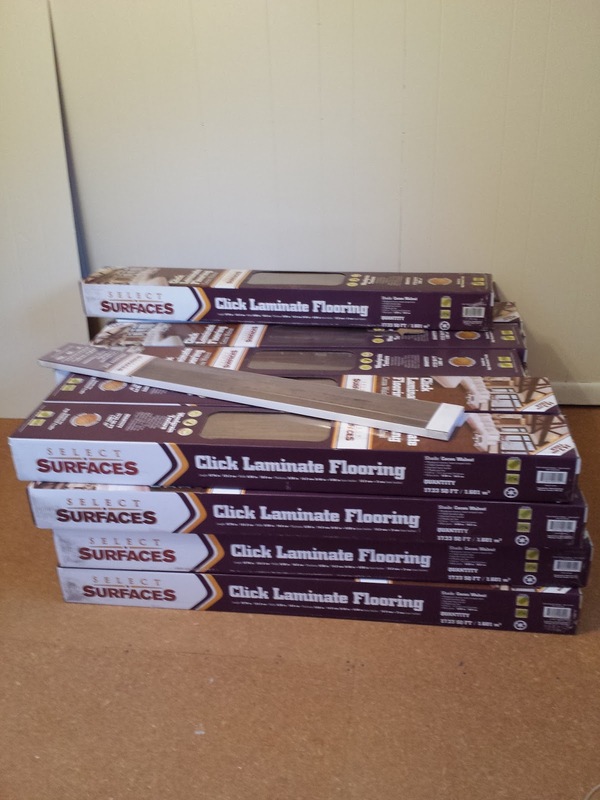 Boxes of laminate flooring acclimating to the house. It took a long time to figure out what laminate we wanted. 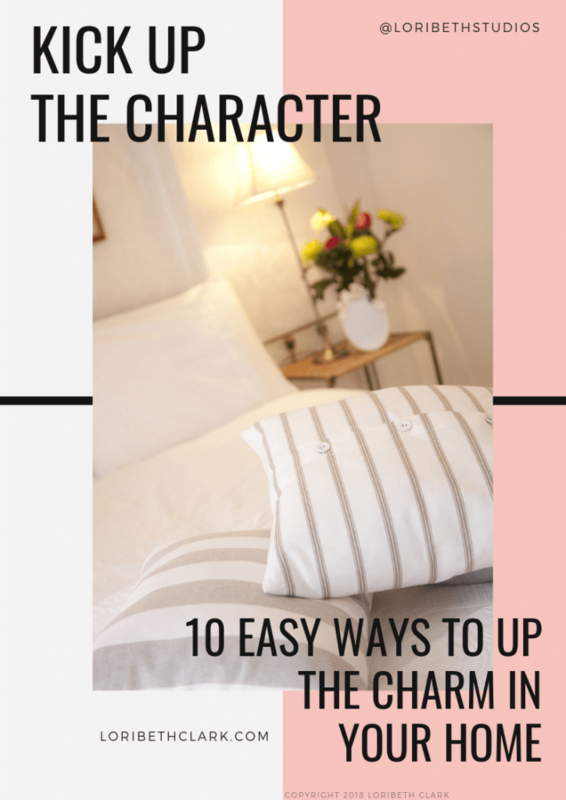 My design plan calls for something rustic since it is loosely a French Farmhouse design, and it had to be durable since we have two senior pets. Now I don’t care what anyone says, laminate is never going to look like real hardwood, so I also wanted to make sure whatever we chose didn’t look like a cheap imitation of the real stuff we already have. After looking at numerous stores, we ended up buying our laminate at Sam’s Club. Who wudda thunk it? It’s called Cocoa Walnut, it’s 14mm with a pre-attached pad. The handscraped, 6 inch wide planks in a dark-medium brown walnut have the rustic look I wanted. 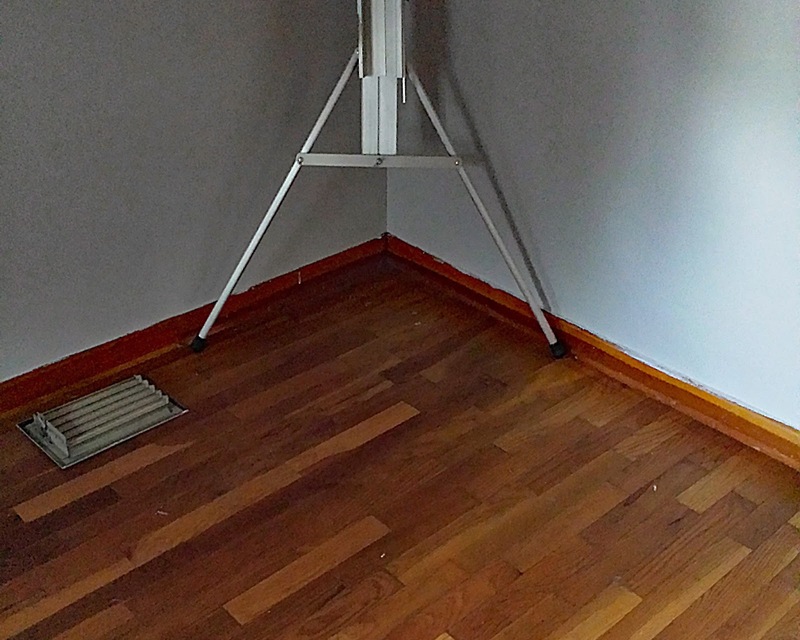 New flooring in the master bedroom — Before, During and After. Jim thought the best place to start would be in the master bedroom, because it’s not one of the public room. It made sense to me. Start in the room where we would be the only ones to see the mistakes. But you know what? Installation was so simple, it looked perfect when we were done! The Master isn’t finished yet. The trim and the closet doors need to be installed, but getting the floors down completely changed the feeling of the room. Painting the paneling made a difference too. My friend Karla says we’re pulling the house into the 21st century, which is good since it was stuck in the 1970’s. 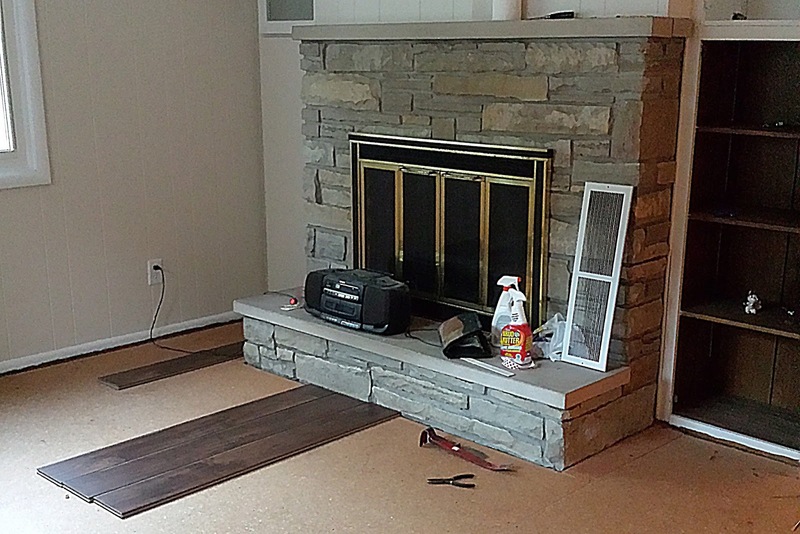 Testing how the new flooring will look next to the fireplace. After practicing on the Master Bedroom, we found our rhythm and moved onto the Family Room. Figuring out how to do the laminate next to the fireplace slowed us down a bit, but once we decided on a plan, it went really fast. I forgot to take pictures, but we love how it looks next to the fireplace! 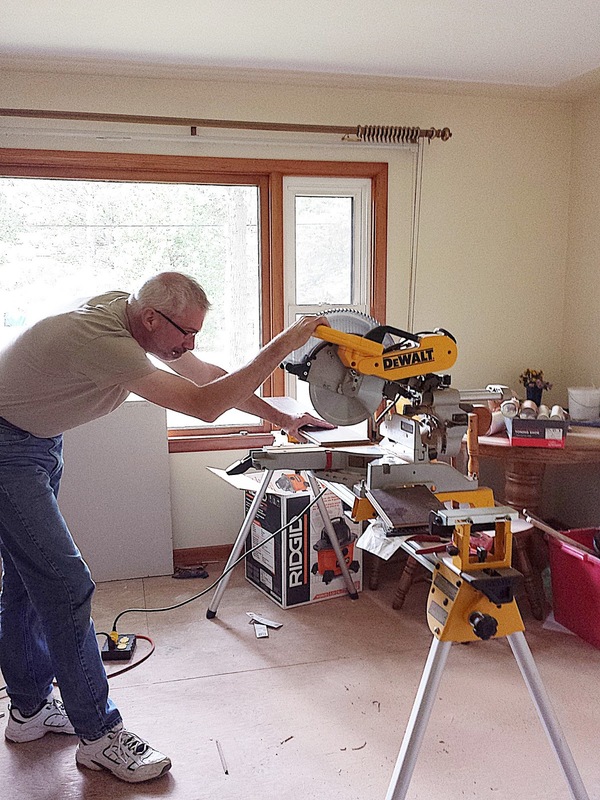 Jim did a great job on the floors, and everything else this past week. We didn’t get everything done that we wanted to get done during his week off, but we got a huge part of it done. We’re way ahead of where we were a week ago, and that’s fantastic. We actually see an end of the renovations in sight! There was a lot of cutting to do in order for it to look right. AND… Yesterday our cabinet guy called. Our kitchen cabinets will be done this week!! Whoo-hoo! We’ll be picking them up on Monday, and then you’ll get to see what we do to the kitchen! Can’t wait!! Please leave a comment and share this post with your friends. I’d love to hear from you! Hello! I'm thinking about purchasing the same flooring, and I would love to see how they look? Do you think you may be posting any more photos of the finished product? Hi Amy! Yes!!! I will be posting more photos of the finished product. I would have posted more already, but we're still working on the kitchen, and they haven't been installed there yet. I hoping we'll be done very soon, because I'd like to be in before Christmas. Great, can't wait to see the finished result. I actually picked up 3 boxes of the flooring today at Sams Club to test it out. I think you're going to love it. I know we do!